In my wardrobe I have two reversible items. One is my Dutch skirt. I do want to copy this garment eventually but I am in search of a very long, chunky, open-ended zip. I have one that is 30″ long, but I would ideally like one twice that length. The other is an Ikea bed cover made up of four squares of very lightweight cotton lawn. The fabric appears to be block printed but is probably not, but the colours work nicely together. 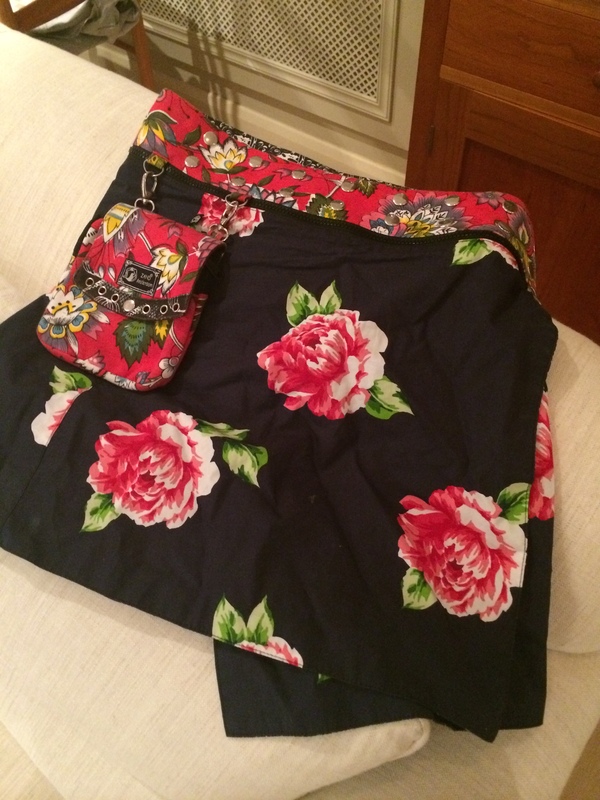 Although not strictly a skirt I generally take it on holiday with me, where in each of its four combinations, it serves as a floor length reversible skirt. Because it is so light it easily fits into the luggage, and because it is so versatile it has been to many different places over the past 10 years – Christmas in Mumbai, Tibetan Monastery visits, Nepalese breakfast at sunrise, NYE on a boat near the equator, Port Douglas fish restaurant, Shanghai musical evening, visit to the market in Accra, Valley of the Kings excursion, sitting by the pool in Seville – for example. The joy of this “garment” is its versatility and that with four or more T-shirts it makes up so many different looks. But the thing I like best about it is that one of the other sections always shows, ensuring two patterns are visible at any one time. I am not proud of these drawings, or should I say “doodles”. But I share with you the kind of thing that sometimes happens to me in a meeting. I am listening quite intently but my fingers start to itch and I draw little pictures of people. 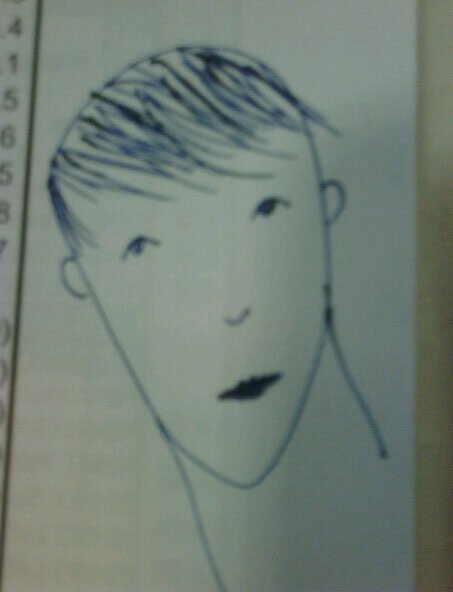 It’s mindless; the drawings are not very good; but sometimes I catch a likeness of someone. And it is a bit the same with my “design” ideas. My mind wanders a little so I draw something I want to make. I had never really given reversible garments much consideration other than thinking I might do a reversible coat one day. I remember at college Mrs Tregelles explaining that one student had been allowed to do a reversible coat in our tailoring class (25 years ago), because she was already very experienced. This exhaulted student didn’t need to learn how to tailor, as she already knew it all. 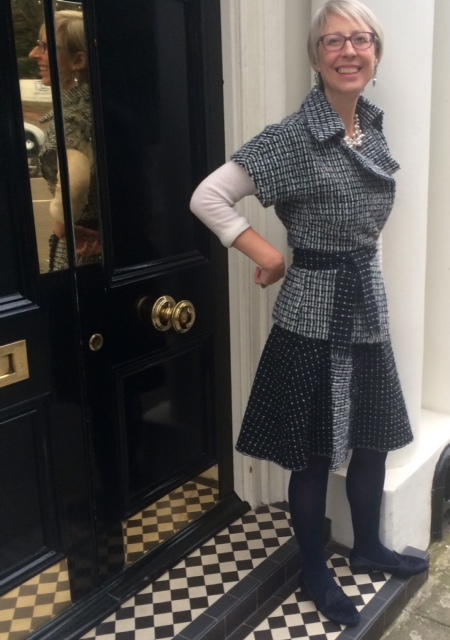 She had a different challenge – the reversible coat. I suppose in the back of my mind this reversible coat was the pinnacle of tailoring achievement, and I had not arrived there yet. When the children were small I did make several pairs of lined/reversible trousers in complementary colours, so when the legs were rolled up you got a flash of yellow print against blue trousers, for example. Once I worked out a quick construction technique doing two layers was just as quick as one. This photograph shows the sort of thing I mean. So this year’s SWAP challenge put the idea back into my brain and I rushed to make a reversible skirt. 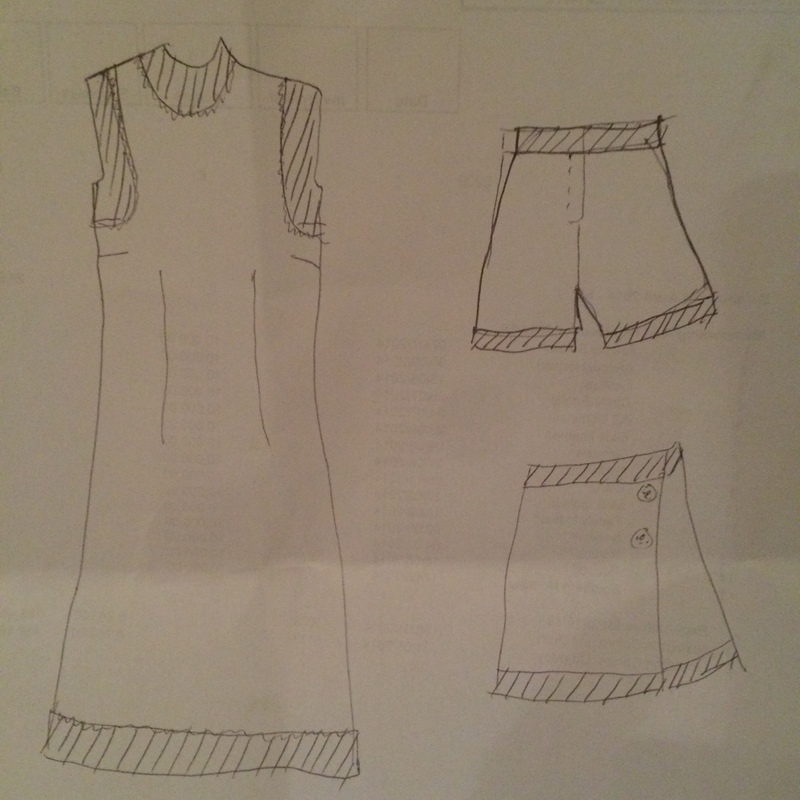 I haven’t included it in my 11 garment set, but I can’t stop thinking about the idea. You can see the skirt the other way around here. The facing shows, as does the waist band. At present I have only overlocked the hem. I don’t know if I should turn it up as per my drawing, bind it in black or navy, or just leave it. So what are these little drawings trying to communicate? When I made my Simplicity 7305 shell blouse, on a whim, and again stimulated by the SWAP requirements, I made it a little longer. In womenswear, the shell top died a death in about 1968, and has only come back very sporadically (although there are quite a lot of tops with zips at the back available at the moment). It was essentially a smooth, simple overblouse to be worn with a suit, in a complementary fabric. It was a quiet garment, that just provided a bit of wall paper for the suit. On the whole they have been superseded by T-shirt tops, often in luxurious fabrics. But I lengthened the shell top to create a tunic that works nicely over trousers. Then I imagined lengthening it to make a dress. A reversible dress is a less obvious item. This would require taking the back zip down to the hem and making it reversible. And rather than doing two plain fabrics (one outside and one inside) I considered making a feature of the facings; ditto the hem. So that on one side it would be plain, and on the other it would be two fabrics. In fact the facings could be a different shape. Obviously the traditional “all in one” facing that covers the neck and armholes while avoiding the darted areas. But a yoke would be an alternative, creating a sort of colour-block look. If the dress was plain on one side (and faced) and one the other it had decorative facings and hems, and had a zip at the back that reached the hem, then could we have a reversible shell dress? The same of course goes for the wrap skirt where waist band and hem are from the underside of the cloth. This is the idea I was playing with when I made up the skirt above. Rather than disguising the fact that there is another skirt on the other side, this skirt shows its workings, and celebrates the fact that the cloth has an interesting underside. I am not sure it works, but I can’t let it go yet. And then there is the shorts idea. This is my most radical idea. 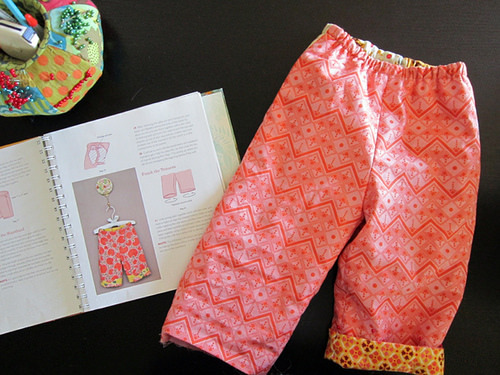 Winter shorts with an elasticated waist band, where on one side they are plain and the other side they look like my diagram, with a contrasting waist band and hem, or turn ups if preferred. I really like this idea and intend to try it out at some point. I like your sketches! I do the same all the time and they don’t have to be my best drawings…just an expression of an idea. I admire the way that you are embracing the challenge of making something reversible. I once had a reversible coat but I only ever wore the one side, so I admit that I am a little bit “meh” fashion-wise at the idea of reversible garments in general. That said, your skirt and sash above work quite nicely, and I can see the utility for travel. The challenge of succeeding in making an interesting garment work in this way is also understandable. I’m curious to see how a shift would come out of this. Yes it was your remark Stephanie, that led me to fish these doodles out of my bag and put them on the internet! Love that skirt – great idea. I am thinking of a reversible tank top. Looking forward to seeing your dress.